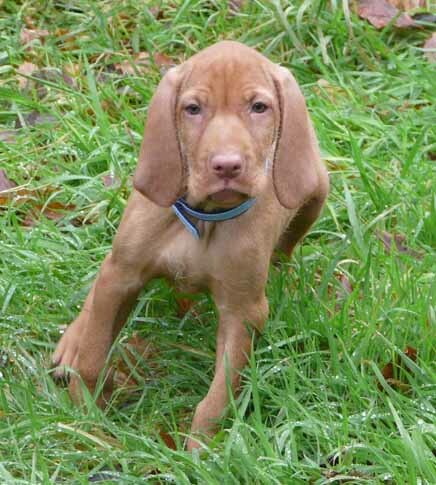 introductions | Belatarr Hungarian Wirehaired Vizsla. We took Phoenix to meet our friend Robie, she’s not a big dog fan, but seemed to like our large eared lady. Of course Phoenix did slightly let the side down by chewing on Robie’s rugs – but I guess we should have taken a stuffed kong to distract. I don’t think we’ve been banned, but it took a good deal of playing the cute puppy card to get away with it. It also helped that one of us faked a heart murmur to take the heat off of her. Oh, and there were flapjacks and a trip to the Common too, but nothing exciting happened. 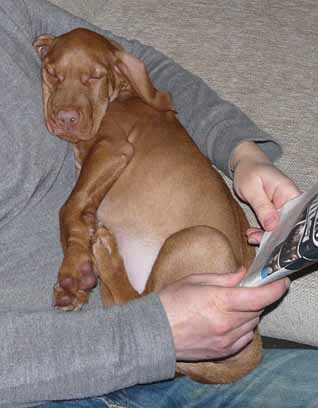 No Sir, She’s NOT a Ridgeback. Twice more over to the common today, with another twenty to twenty-five dogs met, sniffed and played with (along with their attendant human companions). 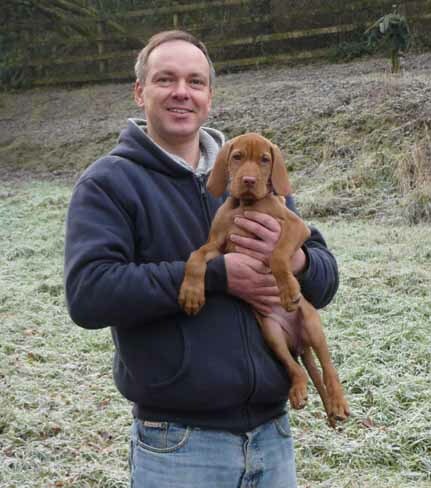 Rhodesian Ridgeback (not close, no cigar, no money back). Ringcraft Day! 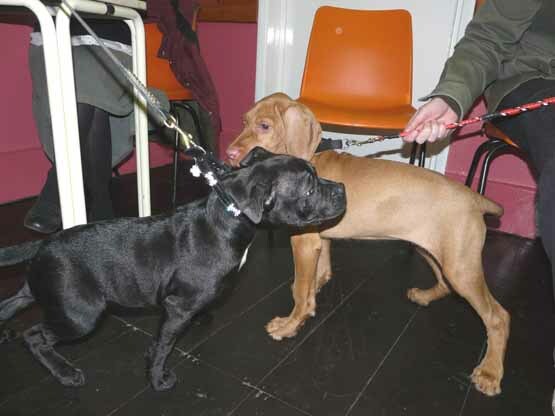 Phoenix was invited to a meet ‘n’ greet at the Ilfracombe and District Canine Society, with a view to joining in the ringcraft training a little later on. We were warmly welcomed by Maria and friends, to an extremely busy dog and people packed town hall, where ringcraft practice was already in full swing. This wasn’t a quiet gathering or bohemian soiree, more like a full on dog-fest with over 30 canines and fifty people. We were there for two hours where both Phoenix (and us) engaged in non-stop chin and tail wagging (respectively). Notable meetings for Phoenix included a gaggle of King Charles Spaniel puppies, a truly enormous dog Weimaraner, a lovely maternal long haired dachshund, various golden retrievers and a plethora of Staffies. All of whom were very happy to get to know Phoenix. We had a high level of excitement all throughout the evening but Phoenix calmed down by the end of the evening. Extreme doses of dog seem to be working already.The other notable event of the evening was meeting the first (and perhaps only?) person to know what breed Phoenix was. He came over and said “I used to look after 12 of these”! Phoenix is eleven weeks old today. It’s quite hard to get your head around the fact she’s only been on the earth for less than three months. It feels like she’s been with us forever (in a good way – well, mostly!). 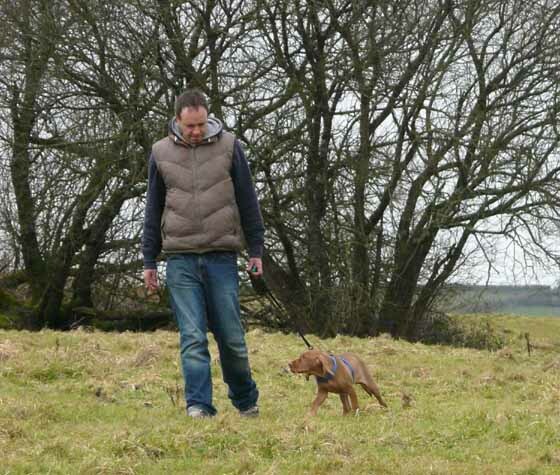 Perhaps even more importantly, Phoenix is now allowed on the ground and can socialise with other dogs. Something that both we and she were desperately keen to get started with in order to desensitise her to other dogs, and learn that not every dog is an exciting puppy-like playmate (although some still will be, which is always a bonus in life). 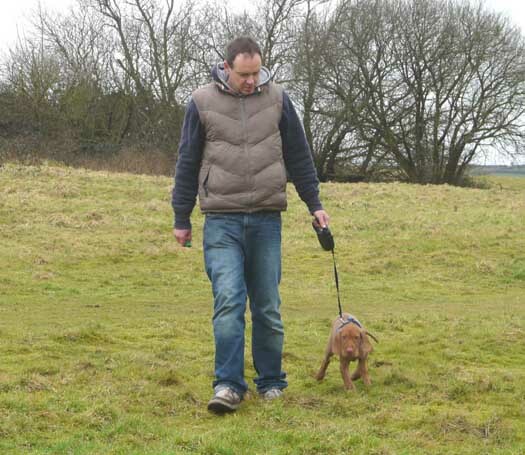 With this in mind, after following the usual morning routine of clicker training and heel walking at home, we headed out for Torrington Common to see what canine introductions we could rustle up for the little’un. Finally, amongst a rather sparse showing, were a pair of Chows who despite their reputation as being the dogs most likely to eat their owners*, turned out to be relatively friendly and of course extremely fluffy. Everyone enjoyed a good sniffing session. Later in the day we went back and met eight dogs who gave Phoenix a kaleidoscope of different reactions from gentle playful Clumber Spaniels to a snarly Black Labrador who we gave a wide berth. 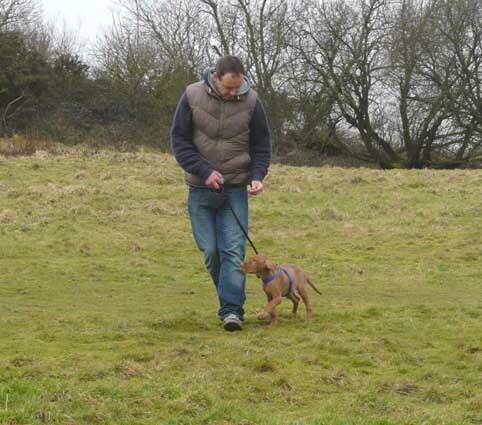 Yet More Heeling on the Common. *this was quoted in an episode of Pushing Daisies and is of course untrue. Puppy Gurus Day! This was the first time we took Phoenix to her (our?) obedience class. Unfortunately, her vaccination status is such that she’s still not able to be let on the ground with other dogs. However, she was able to “mingle” with the other vaccinated puppies in class. She started as she meant to go on, by submissively urinating on the floor in front of an ultra-bouncy collie. It was all a little frustrating because her lack of contact with other new dogs means that she “over-reacts” when she does finally get to socialise with the canine kind. All our previous training obviously gets filed away somewhere in the deep recesses of her doggy mind. Hopefully, this is something that will improve rapidly after tomorrow when we can start mixing her with the general dog population. On the plus side, Phoenix did (eventually) remember how to sit, lie down and stand after bribery with garlic laced liver chunks (yum!). Ultimately, she was more interested in meeting and greeting the other five pups. Roll on tomorrow and the biog wide world…. Another trip around town in the sling. Phoenix was a huge hit in the local pet shop. Over a dozen people of all shapes and sizes came up to speak and pet her. One person said she liked the way Phoenix’s skin was so loose – we explained that she still had a lot more growing to do… More great socialisation experience – as usual she greeted everyone like a long lost friend, despite the towers of dog chews, pigs ears and assorted canine ephemera, she remained remarkably well controlled. We tried to introduce her to Jethro the African Grey parrot but he was more interested than she was. Tracey also works with violent teenagers using the same techniques so, respect due! Apart from a spaniel, Phoenix was the largest dog there, this didn’t stop her getting out and about and pressing the flesh though- she was polite and enthusiastic and remarkably self controlled. She did struggle during the early part of the party, as the dogs were let off the lead one at a time over the two hours, for around ten minutes. No problems in the car – now definitely established as the provider of good things and the vet as her favourite place EVA!!! *I love the fact that nothing is ever the puppy’s fault, it’s always the owner who’s to blame for not thinking ahead. It’s a very “oy vey iz mir” approach, but it works.